So then I decided that I should turn out the places where I store wool and woolly things which turns out to be more than I’d bargained for. There are garments – current and old, yarn in stash, yarn in ongoing knitting, cashmere, alpaca and wool tops for spinning, and wool blankets – knitted, crocheted and woven, Not to mention a couple of suits and jackets. First to get opened up was a trunk full of old garments that I keep, a personal archive. There’s a mixture from things I made years ago to things I bought and have never worn to outfits from Trent Polytechnic back in the 1980 s.
This is an Orenburg shawl, brought back for me from the USSR as it then was by a friend who’s a research physicist, so he know lots of Russians and used to go there quite a lot. It was bought in St Petersburg and is now at the dry cleaner’s. A Shetland scarf, bought there on a visit in the 1992. Also at the dry cleaner’s right now. A rather nice hat, hand knitted. The label inside says it’s from Lithuania but I’m not sure how I came by it … it has been hand washed. A Shetland tam, bought there. A cotton bag to put handkerchiefs in, hand knitted in Zimbabwe and brought back by me in the 1990s. 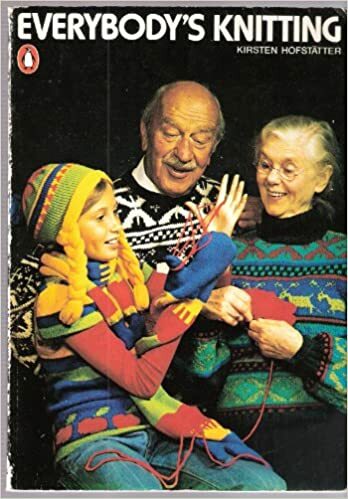 My hand knitting, inspired by the Danish book, Everybody’s Knitting. It started out life as a dress, and ended up as a skirt and top for my daughter aged about 7 at the time. All wool was unravelled from other garments bought in charity shops. A cardigan designed and knitted by a Japanese company from when I worked with Japanese knitwear producers. My sweater drawer has been taken wholesale to the dry cleaner who are giving me a good discount on bulk, including lace items that I really don’t want to have to block and quite a lot of cashmere. The yarn has gone into the freezer for a while. Information on the web varies on the length of time things should stay there, from 2 days (Vogue magazine UK) to a week. I have been told 3 weeks so who knows what the correct time is? (If you think you know, please tell me pronto!). Other items have been handwashed and are now ready to go back in the trunk, all sprayed inside with moth killer spray and new newspaper. And then of course, there’s the big question – why keep most of this stuff at all? April newsletter… or should it be March? But it’s not an April Fool anyway as it’s far too late. Lots of exciting things happened during March. I went to a fashion show at the V& A museum …. So you can see that life for the glove knitter has been busy again this month. I worked with him last year to design and knit 2 pairs of hand knitted gloves which were in his show. This season I made 20 pairs of hand warmers on the knitting machine and these are the ones being worn in the show this March. I’ve also got some orders for making more! The March show had the men wearing the clothes coming into the gallery space led by a singer, who was Vivien Ellis. Here’s some pics of the show. These are for my friend Jenny and they take their patterns from a vintage pair that I saw in a picture in Text magazine. I have taken almost a year knitting 2 pairs which is just TOO long. Without a firm deadline I tend to drag my feet on any project. They have been washed but not pressed. I’m planning an designing a set of at least 4 gloves that will be made for friends as I have done in the past. But this time, instead of letting them choose colours I am specifying the colours and patterns and the person they are for will be able to add their initials and a date. I’ll also knit each pair to size for each person by drawing round each hand. I’ve been wanting to design a set of gloves for a while and for this set I’ve returned to my favourite source of images from nature – I’m working from a set of pictures taken in Wales and California of the beach and trees so the underlying theme is nature. I decided I wanted to use the best quality wool I have in my stash as I need up having to use some rather stringy British wool 3 play to complete the last pair. I have been given some Jaeger 3ply Botany wool and some Marion Foale pure wool 3 plays along with Regia 3 ply in my stash. So I have a very lovely palette of wools to design with. I have been posting some of the images from my sketch book on Instagram and they are here. So the plan is to aim to knit a pair each month to have these complete for the autumn. Some news, some pictures and some plans …. I finished the music themed gloves for my friend Nick apart from darning in the ends – which is quite a big apart from … but if I sit down with a good radio programme on it should only take about an hour so I need to get a grip and get on with it, mostly so that I can start the next pair. We started and ended in Toulouse and also had a short stay in Albi at the end of the trip. Both were centres of the pastel industry in the Middle Ages, to the extent that the motorway connecting the two places is called the Autoroute de Pastel. Pastel was a blue dye, extracted from the same plant as woad, and was used before indigo became available from India. It’s interesting as the activity has been used to generate new businesses making cosmetics like Graine de Pastel. Another one in Albi is Terre de Pastel which has a shop right by the cathedral in Albi with rather lovely blue scarves and lots of other things. Vanessa France’s blog has more on the history of the pastel trade. A further textile interest was found in Albi, not just in the clothes shops (several rather nice ones) but in the form of a producer of local textiles, Les Toiles de la Montagne Noire. These are locally produced cottons, plain, striped or checked and sold as yardage or made-up into household textiles including tea towels, tablecloths, aprons and so on. Naturally some had to be bought as presents – there’s a bit of a tradition building up in the family of giving tea towels, hardly original but useful. This production is similar to some of that found in Wales and Ireland where locally made textiles add to what’s on offer for both local and visitor markets. I would have bought the whole shop had I not had to carry it all back on the night train from Toulouse to Paris and then onto Eurostar and so home to Huddersfield. Knitting wise I took socks with me as my partner had said that he would like some. He doesn’t often make requests so I thought that this was a Good Idea as a change from knitting gloves. I fully expected to finish the pair in a fortnight, long train journeys, easy evenings on the terrace etc. I’m just above the rib on them both so lots to do still. When I went to Estonia, to Craft Camp, last month, see previous posts, because of the lack of direct flights to Tallinn the capital, from the north of England, and my horror of the larger European hubs (Charles de Gaulle, Frankfurt, Schiphol etc; bad experience both ways last year, long story), I decided to fly to and from Helsinki from Manchester, then complete the journey to Tallinn by ferry across the Baltic, just a couple of hours. So it came to pass that I had two stopovers in Helsinki, one on the way to Estonia, and one on the way back. On the way there, I had most of the afternoon and evening to explore and the morning of the next day, before catching the ferry. On the way back, I had an evening and morning before heading out the to airport. Well, I stayed in a trendy boutique hotel, The Klaus K, which was very central with helpful staff and had rather lovely bas relief in granite by the front door, the only thing is, I’m not sure what they are doing. Something with grapes perhaps, although you would think that Finland would be a little far north for that? The water was not far away and of course it was light until late. I also found a great pizza place, my favourite, and some great shop windows. The following morning, when I went into the main station to buy an English language newspaper (The Financial Times as you ask) I discovered that it is the most wonderful Art and Crafts/Art Deco building with it seemed, most of the original features still in place. Note the addition of the Burger King sign. Then off to the docks to find the ferry, using the tram system, cheap and easy, but it would have been walkable in fact. The ferry was brightly painted with a huge disco area and seemed to mainly serve people going across to Estonia to buy cheap booze, which I discovered on the way back when I saw inside a huge hard case full of multipacks of cider. The second shop, within a few minutes of my hotel, didn’t open on a Saturday. The third was too far away to get to that day. But after that, I had the Design Museum in my sights, Helsinki being one of the hotbeds of mid-century modern, so fashionable at the moment. The permanent exhibition is an excellent exposition of Finnish design from about 1850 showing how the emergent state used it, and still does to some extent, as a means of creating national identity and of improving standards of living. All this I approved of thoroughly and enjoyed very much. Other exhibitions, which approached design more from the point of view of the design superstar, in this case, Eero Aarnio, I was not so enamoured of, although there was some interest in seeing the construction of ‘iconic’ 60s objects that he was responsible for like the ball chair that is an almost complete sphere. Anyway, this is the type of ‘design’ that I find most irritating, the designer making statements about “it is also possible to create a new need, a good example of which is ‘Puppy’, which I designed. No one needs it, but there are so many who want it to have it” (from the web site). Why does the world need small models of puppies in brightly coloured plastic? So that was Helsinki, for me. Next year, I might go via another route. 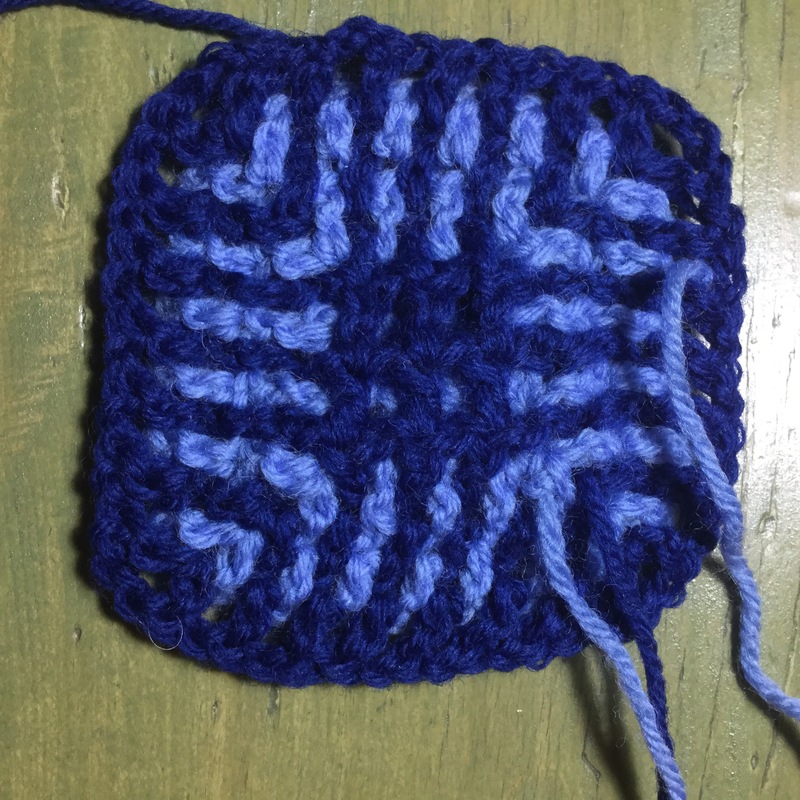 Going back to the Knitting & Crochet Guild Convention in early July, one of the workshops I did was the Double filet crochet, on the grounds that it was something that I had never done and know little about. The piece is about 4 inches or 10 cm square and the top view is the face and the lower one the reverse.In the centre you can see the 2 layers of filet mesh, one over the other. The technique was very ably demonstrated and taught by Barbara a and Michael Mann, who have made this a speciality, running the East London Double Filet Crochet Group for many years. See their web site here for more about this fascinating technique. 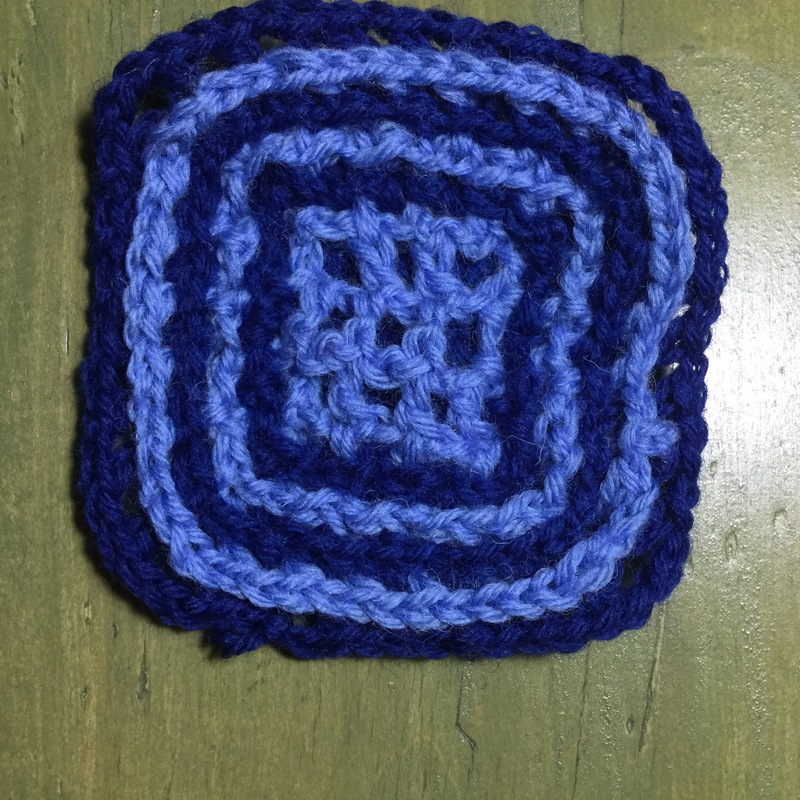 There’s also a Double filet/Interlocking crochet group on Ravelry. So my scrap is but a tiny start, a beginning of many potential projects and design challenges. Last year I went to Estonia, my first visit. I attended the second Estonian Craft Camp in the beautiful campus of the Olustvere School and Manor. Estonia take ‘traditional’ crafts very seriously and have used them as part of nation building in a similar way to other countries such as Finland and Norway. See you there in July 2016? I’ve been working on this crochet blanket for, probably, 10 years, perhaps more. It was supposed to be my ‘easy’ project, that I could do when talking to friends or in front of the tele. It was also started with the intention of using a large bag of wool, mostly left over from my Masters course in the mid 80s, and a batch of indigo dyed wool. This wool was in hanks, very overspun, grey, originally from Craftsman’s Mark, a yarn firm that some of you may remember, which was owned and run by Morfudd Roberts. This I indigo dyed to various shades of dark blue. The idea behind this blanket was to be quite improvised looking. I was freed from being too neat with crochet by the book, Louisa Calder’s Creative Crochet in which she shows visible joins in colours and other irregularities. Some of the reviews on the Amazon page are interesting – some people ‘get it’ and some don’t. Anyway, the whole project has been a design challenge as the quantities of yarn seem to have altered – more indigo dyed wool to use, then less, then more on one side than the other, then the whole thing getting far too big and so on. It started as a series of pieces and then got added to with strips being crocheted for the sides, and so on. I am pleased with it though, although I think the wools used for the final edgings are too new and bright, but I’m hoping that I’ll stop noticing this in time. I’m pleased with this – it looks like I intended it to look, by and large. I now have a large bag of hand spun yarns left from my mother -what am I going to make with them?